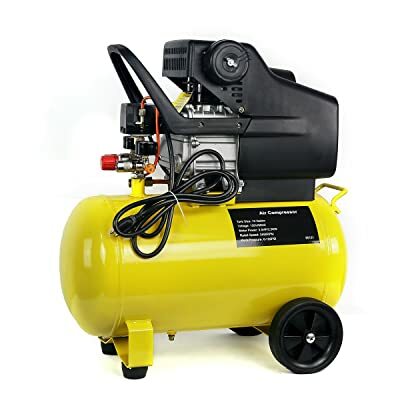 If you are reading this, I bet you are on the search for a heavy-duty air compressor and at this point, you should have known that such machines require you to spend more time doing your homework than others to navigate through the sheer amount of choices out there. I have done the same thing and ended up purchasing the air compressor of my dream, and I have gathered everything I have learned along the way in this list of best 10-gallon air compressors for home use below. They all come from trusted brands and have received many positive reviews from users. I hope that what I share here will help you land the most suitable air compressor with minimum hassle. 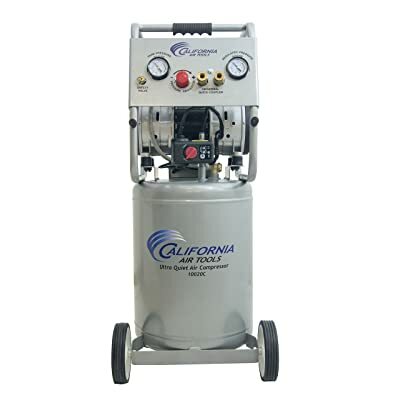 California Air Tools was founded in 2002 and since then has introduced several innovative products like Ultra Quiet & Oil-Free Air Compressors to improve customers’ experience. A friend who usually uses a vacuum press for veneering recommended me the CAT 10020CAD. With the weight of almost 82.5 Ibs, it packs some serious muscle yet is unbelievably quiet for a compressor of this size. The noise is at 70 dB measuring when I was standing next to the compressor and taking readings at ear level. It then dropped to 60 dB when I was 10 ft. away. If you have a store that connected to your workshop or your family lives near where you work, the CAT 10020CAD is an ideal choice since its minimum noise won’t put off anyone. The motor operates quietly at 1680 RPM, which contributes enormously to longevity. Even when it starts at empty, the large 10-gallon tank can fill up in less than 130 seconds, an unparalleled feature on this list regarding its size. CAT 10020CAD’s 2 ¼ connectors with a quick release action allow simultaneous use of 2 air tools. The delivery rate of 5.3 CFM at 90 PSI allows you to hook up some powerful tools or a number of less powerful tools to it. Another benefit of purchasing an air compressor from California Air Tools is that it comes with an array of choices, the auto drain version (10020CAD), the manual drain (10020C), the 110 volts, and the 220 volts. Despite being categorized at portable air compressor, the CAT 10020CAD is anything but light or compact. The unit is huge and bulky at 82.5 pounds; it is measured about 31 inches tall, so if you don’t have a generous amount of space, the height can be a problem. While other products on this list are featured with no-flat tires, those of CAT 10020CAD are made out of cheap hard plastic, an obvious drawback considers its price. Whether this will be a good pick for you depends largely on what you’re going to use it for. If power is more required than portability, the CAT 10020CAD fits the bill. WEN has been designing and distributing affordable power tools since 1951. The WEN 2280 air compressor can cater to all kinds of pneumatic tools such as wrenches, nail guns, drivers, staplers, and grinders. With a maximum pressure of 150 PSI, you don’t have to worry about its power output. The WEN 10 gallon compressor also has an impressive flow rate of 4 CFM at 90 psi. When the tank is filled to the maximum pressure, the pump shuts down, when the pressure begins to run down, the motor cuts in to fill it up, all are automatically. No oil or maintenance is needed for the air pump, which greatly reduces the time you have to spend to care for the machine. 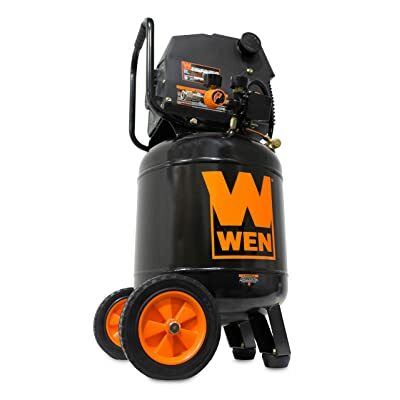 The WEN 10 Gallon Oil-Free Vertical Air Compressor will be a good pick for those who have limited time for maintenance and don’t bother putting up with a little noise. At around the middle of the price, the rack is this air compressor from the famed and trusted Stark brand. Stark Industrial LLC’s history dates back to 1959. Now the company covers a large market of environmental control, medical, aerospace, machine tool, steel, rubber, and food processing. This is the one I have at home right now. It’s great with most of my DIY projects and I’ve heard some people said that the Stark can handle some commercial applications too. Delivering maximum pressure of 125 PSI, the Stark 3.5HP air compressor is less powerful than the WEN 2289 but it has an edge in portability. The Stark 3.5HP features an aluminum head, which reduces heat emission, protect the components inside the machine, and prolong the life of the compressor. The Stark 3.5HP is an electric-corded machine. It also features a fully-enclosed belt drive to reduce noise for your ears. Its fuel source also spares you of emissions if you have to work indoors. The cylinder is constructed from cast iron with valve plate, crankshaft and the motor is oil-lubricated making the compressor highly durable. Its tank is powder coated so the chances of rust getting into the system are minimized. With the weight of just 55 pounds, the Stark 3.5HP is mobile on two large wheels and two rubber stabilizers, which ensure that you can easily transport it around but it will stay still when you work with anything vibrating. It has two couplers so that you can connect two air tools simultaneously. The Stark 3.5HP’s pump is oil-lubricated to prolong the life of the machine, but this also means that you have to spend more time on its maintenance to make sure it reaches its full potential. The plastic handle is another drawback; it is quite fragile compared with other components. The Stark 3.5HP will be an ideal candidate for those who treasure light weight and portability over the compressor’s power. Another compact and portable candidate on our list, the Speedway 52956 is a quiet air compressor for anyone looking for a long-term solution for the home. Its reviews online have proved that it can last for a long time thanks to the rust resistance feature, a durable tank design, and oil-lubricated motor that will allow you years of use under proper care. If you don’t have much space to store an air compressor, you will love the fact that the 52956 features a portable design, with a weight of just 60 pounds and dimensions of 28″ x 13″ x 26”, it can fit perfectly under the workbench in your garage or shop. One of the best features of the Speedway 52956 is that it is highly durable, but on the flip side, you have to take the matter into your own hand and do more maintenance for this one than you would have to on other air compressors on this list. 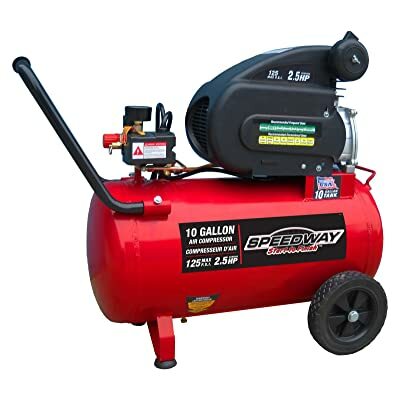 This Speedway compressor is ideal for inflating, nailers blowing, and other small tasks. If you’re looking for a garage air compressor, this air compressor is a wise choice. As a brand comes from Japan, Makita has had more than 100-year experience in providing power tools. Makita makes an impressive showing on the list with the MAC5501GR 5.5 HP Lube Gas Air Compressor with unmatched performance and excellent customer reviews. This is why it ends up on my list of best 10-gallon air compressor for home use. The 10-gallon twin tanks provide a generous amount of air supply that can cater to multiple nailers, which makes it the ideal for outdoor tasks like framers, roofers, siding installation, fencing, farming, general contractors, and rental industry. What makes this air compressor stands out is the cast iron pump with Big Bore™ cylinder and piston to provide greater durability and shorter recovery time. The pump is oil-lubricated to reduce wear. The Automatic idle control is highly regarded by Makita’s users as it saves oil consumption and helps the air compressor lasts longer. Tough, minimal fuel waste, and re-charge quickly, Makita MAC5501GR will be a good companion to assist you around the house. At the net weight of 192 Ibs, Makita MAC5501GR is sturdy on the wheels, not the lightest candidate on this list but it features 10’’ non-flat tires for easy transportation and compensates for the heavyweight. However, the strong gas emission from the machine can be hard to work around, especially in enclosed spaces. The replacement parts can also be hard to come by either. 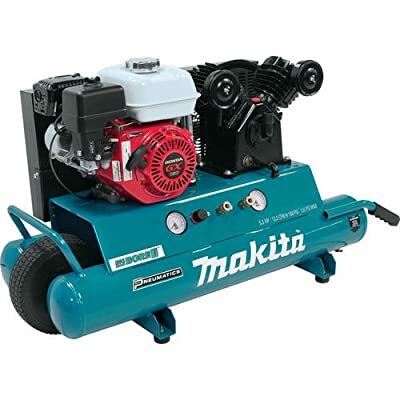 With all the advantages, Makita MAC5501GR would be a safe choice for those who would like to have a powerful and reliable air compressor and don’t mind the emissions. Since its start, Dewalt focused on versatility for individual workers. DeWalt DXCMWA5591056 includes everything one may expect from an air compressor for home use: quiet, durable, portable, and compact. If I have to squeeze everything I’ve learned about this air compressor into just one sentence, it would be the DeWalt DXCMWA5591056 is built to last. Its head is made out of aluminum for better dissipating heat. 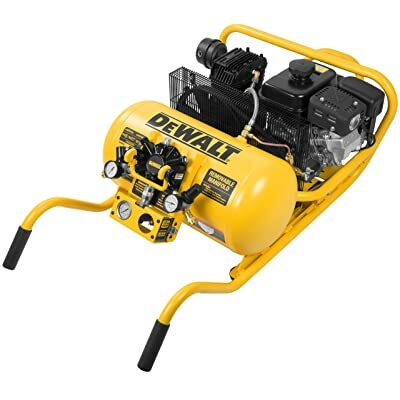 The cylinders and crankcase are cast iron and each DeWalt air compressor is shipped with non-detergent air compressor oil to improve performance. All of these features are to prolong the life of the internal components and make sure the machine lasts. DeWalt DXCMWA5591056 is designed to be with you wherever you need its assistance. The roll cage bar is also the lift handle and it’s fixed with an extra-large center tire so that you can easily push it over uneven terrain. For longer distance, the DeWalt DXCMWA5591056 is compact enough to fits under the Tonneau cover. The DeWalt DXCMWA5591056 doesn’t only have an edge in mobility but it also equipped some features to ensure it does its main job. Two 1/4” high flow style regulators which are more precise and efficient than conventional style ones; and two 1/4” push-to-connect quick couplers. It’s also manufactured with a large 1/2” port on tank for constant air flow through the air hose. As with other air compressors that run on gasoline and are oil-lubricated, the DeWalt DXCMWA5591056 needs more maintenance than its oil-free lubricated counterparts, and it should be used outdoors due to its gas fumes. This air compressor will be suitable for those who need a highly compact, easy to store and transport companion with the work at home. Picking a 10-gallon air compressor can be a tricky task since there are so many choices out there on the market. The six products I have listed above have their own advantages and drawbacks, making them suitable for different needs. I hope with this review, you will soon pick out the air compressor of your dream.